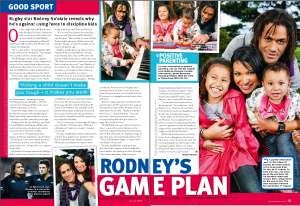 In an article in this week’s NZ Women’s Weekly, All Black and Wellington Hurricanes captain Rodney So’oialo speaks out in support of positive parenting and the current Child Discipline Law. Read the entire article. Thanks to Rodney and the NZ Women’s Weekly! On 10 July 2009 the Police released their 4th six-monthly report on Police activity since the statutory defence for assault on a child was removed from the Crimes Act 1961. In an article printed in the New Zealand Herald [11 July] – “Big jump in child assaults reports” by Simon Collins claims that the number of minor assaults reported to the police has jumped 40% since the three month period before the law change. Taken at face value this could be interpreted as the 2007 law leading to a huge increase in the number of “good” parents being referred to the Police for correcting their children by simply smacking them. This is not the case. To understand why, it’s important to knowhow the Police categorise the cases they report on. Police do not spell out the nature of the events involved in the cases they report but only say that, The terms “smacking”, “minor acts of physical discipline” and “other child assaults” are terms created for monitoring purposes so that the reviews accurately reflect the complex nature and context of each case. But in fact they represent a hierarchy with “other child assaults” being the heavier end of physical punishment. By putting the categories together, looking at monthly averages and coming up with the 40% figure Simon creates a misleading impression. If we use Simon’s average per month approach separately for each category we find that where “smacking” is concerned there is less than a 1% increase between the three month period before the law change and the figures reported in the last Police review. But in fact the numbers reported are so small that it is nonsense to talk percentages at all. About 1 case a month in the three month before law change and about 1.03 in the last review period is not a statistically significant change. Looking at the “minor acts of physical discipline category” we find that there has been a 100% increase between the three month period before law reform and the last set of figures. But in fact we are talking about the difference between say 3 cases a month and 6 cases a month – again too small a number to be meaningful. In the third category “Other Child Assault” we are looking at a rise from about 27 cases a month to 34 cases a month in the relevant periods – a little over 25% increase – but again 7 cases is not a statistically significant change. The slight increase in reporting at the heavier ends of physical punishment should be interpreted positively – as demonstrating a greater willingness on the part of the public to report concerns about the way a child is treated – and as making more opportunities for parents to be given support and guidance to manage their children’s behaviour in more positive ways. The case of the Christchurch ‘ear-flick’ Dad who apparently punched his child on the face and was given an anger management sentence illustrates the point. We must also keep in mind that the total number of prosecutions in the “smacking” and minor acts of physical discipline categories has been vey small over the whole period. Caritas says child discipline referendum will not provide clarity. Catholic social justice agency Caritas says the upcoming referendum on child discipline will not provide clarity on the issue. “Funding for the referendum could have been better used on family education,” says Director Mike Smith. Caritas supports the 2007 amendment that was eventually made to Section 59 of the Crimes Act, and wishes to see the legal status quo maintained, regardless of the referendum outcome. The debate leading up to the law change was always about balancing child protection and family subsidiarity – the ability of families to make decisions for themselves without undue government interference. “Caritas submitted in 2006 that Catholic social teaching required that both be taken into account. In our opinion, that meant giving greater protection for children, and also defining the threshold for prosecution,” says Mr Smith. 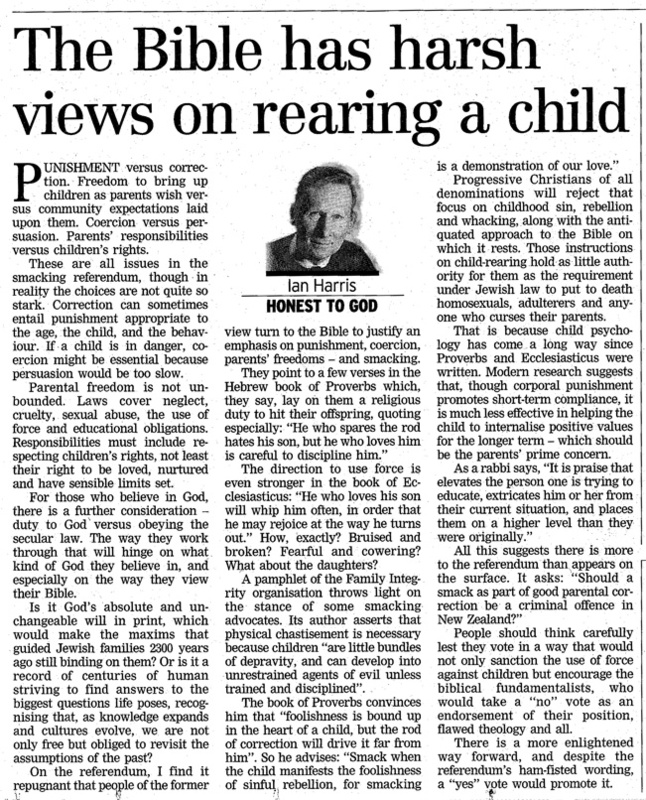 Mr Smith says the upcoming referendum will not provide clarity on the question of child discipline, because it is possible to support the 2007 amendment while voting either Yes or No to the referendum question: Should a smack as part of good parental correction be a criminal offence in New Zealand? However, Caritas recognises that in the political context of the referendum, a ‘Yes’ vote is seen to be a vote for the status quo, while a ‘No’ vote is seen to be a vote against the 2007 amendment. “In this context, we recommend a ‘Yes’ vote, as we believe the status quo is close to the position that we recommended to the Select Committee. However, the wording of the question is so ambiguous, many New Zealanders who support efforts to reduce violence against children, may in good conscience still feel obliged to vote ‘No’. It will be hard to understand what the outcome of the referendum may mean,” says Mr Smith. He says Caritas will be writing to the Prime Minister and other relevant politicians, expressing concern that the ambiguous nature of the question will result in an outcome that cannot be understood as either supporting or opposing the 2007 amendment. Caritas Aotearoa New Zealand is a member of Caritas Internationalis, a confederation of 164 Catholic aid, development and social justice agencies active in over 200 countries and territories. New Zealand has shown real moral leadership with their law reform on physical punishment for children and I congratulate all who worked hard for the repeal of an unjust law against children. I strongly support your endeavours in opposing the unethical and misguided referendum question soon to be put to the vote . I want to comment on the upcoming referendum on “smacking”. I am not surprised that both your Prime Minister and Opposition leader will not be voting in a referendum that is so awkward and misleading in its wording. Their concerns reportedly include the fact that the question can be seen in many ways and that voting will send a wrong message. I agree with them but I worry that those not in favour of smacking will let those who are, win by abstaining from the vote. Yet if only a small number actually vote, or vote “no”, that in itself should send a strong message to the public and government. Nevertheless I encourage supporters of children’s safety to register a strong “yes” vote. I have seen reports in the Weekend Australian (5/7/09), about two recent cases you had in Wellington and Christchurch. In one a father appears to have pushed a 7 year old child at a sports event repeatedly and another had intentional forced contact with his 4 year old son’s ear in a park. Can either be classified as a “smack” as one was repeated pushing to the ground and the other a “cuff” to the ear? Both would have been hurtful and humiliating to the children, but sadly it appears that some in favour of the use of smacking as a “good” parenting tool may be using these cases to support theirs. I wonder if I can ask a few questions about the terms of the referendum and these cases? Do these acts of pushing and striking amount to “smacks” to opposers of reform? Are these parental actions loving acts? Do they show parental respect for the child’s perspectives and worries? Are they examples of “good” parenting? Can homes with such activities be homes filled with love? Do those who believe this is good parenting believe in “light” smacks too? Do voters really want to permit such adult misbehaviour against children? How can “good “parenting include actions that police class as assaults? How is teaching children by smacking them “good” parenting? Is it “good” practice to smack under 18s like apprentices, cadets etc? Will such under 18s learn better with this type of teaching tool? Is it not illegal to teach horses, dogs and circus animals by smacking them? Should the small number of charges require a change in the new law? Why would members of parliament change the law that a majority accepted? Why is it OK to use such large funding to promote the cause of those who want to hit children? New Zealand has been a fine example to other countries where child advocates speak out for law reform on legalised physical punishment too. I hope for the sake of the children of the world that your politicians remain steadfast in their support for equal protection for children.